We head north of the weisswurst border to visit our friends for a few days in Frankfurt for a few pre-christmas celebrations. Roemerplatz in downtown Frankfurt, Germany. With christmas just around the corner, we took off for a few days to visit our friends in Frankfurt who are avid photographers. There was quite a line up of activities planned during our stay. 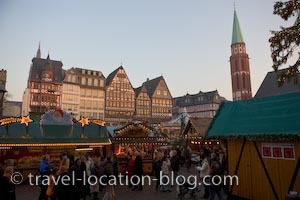 In fact after a quick catch up over a cuppa, we headed straight out again for a photo shoot of Frankfurt city with its charming christmas markets surrounded by historic buildings in the Roemerplatz. After driving into the city, we walking across the Main River on a pedestrian bridge which affords a great view of the city skyline, then slowly made our way through the crowds at the christmas markets. Here in Frankfurt, gluehwein is served up in mugs which are formed in the shape of the traditional jugs (Bembel) used for serving Apfelwein (apple wine) - which is largely produced in Hesse. As the afternoon wore on we returned to the car and drove to a rail bridge which crosses the Main River to set up for a sunset and dusk shot of the city. It was brutally cold, and eventually the fog rolled in. The fog gave the city an interesting glow, and partially obscured the skyline but as soon as the dark took over we left - it was freezing cold! The next day we headed to the towns of Michelstadt and Erbach to visit the christmas markets there. In the evening we returned to Frankfurt and the guys headed out for another photo shoot of Frankfurt ... in the cold, this time I wasn't so game. The next few pictures are taken from our trip to Frankfurt between December 21 and 23 but are only a small collection of course.